Instead of the annual White Sox Easter egg hunt this morning and the re-enactment of the station of the cross post game yesterday, the Sox will be sulking in their rooms instead after their ninth loss out of ten games. 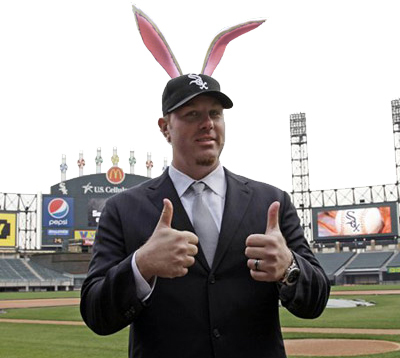 Guillen feels that canceling the traditional Easter events for the Sox will get them “mean.” It is a bit of a disappointment for the team as new comer Adam Dunn was going to play a double role as Jesus in the station’s of the cross and this morning as the Easter bunny, which some were calling the Bonkey or Dunny. The Sox look to get on the right track this afternoon. Next Next post: Week three – Embarrassing!